The winter quarters of the Lewis and Clark expedition in 1805-06, Fort Clatsop is located south and west of Astoria, on a rise just west of the Lewis and Clark River (map). The Corps of Discovery arrived in the Columbia River estuary in late November 1805 and initially landed on the Washington shore at a point just downstream from the north end of the present-day Astoria-Megler bridge. This place, which the explorers called Station Camp, proved to be an undesirable place to spend the winter. The area was open an exposed to the frequent rain and wind. Also, there was little game in the area, and the expedition needed elk and deer not only for meat but for skins, as their clothing was rotting in the perpetual dampness of the lower Columbia in fall and winter. Clark favored returning to The Dalles for the winter, but that was out of the question as the season was late, the weather was deteriorating and the captains hoped to encounter a trading ship in the estuary in order to replenish their supplies and obtain trade goods for the return journey to the East. Their best hope of encountering a ship was to stay in the estuary. The corps voted — all members had the opportunity to vote — to spend the winter on the shore of the Netul River (that is the name Lewis gave it; the river since has been renamed the Lewis and Clark River) at a site located by Lewis in early December. Work began immediately, and by December 10 the foundations were laid. By December 14 the walls were up, and the roofing was finished by December 24. The captains moved into their room on December 23, and the remainder of the corps on the 24th and Christmas Day. Thus Lewis and Clark initiated democracy and a form of government in the Northwest by conducting the first public vote, and also, in Fort Clatsop, establishing the first military post in Oregon. Fort Clatsop was not the first military post in the Northwest, however, as Spain had established a fort at Nootka Sound on Vancouver Island in 1789. The name of Fort Clatsop comes from that of the local Indian tribe, which Lewis and Clark mention in their journals. Clark called them the “Clot sop Nation.” The fort included a stockade about 50 feet square built around two parallel cabins separated by a parade ground. One cabin contained three rooms, each with a fire pit, and the other contained four rooms. Two of these had firepits, and the room shared by the captains had a fireplace and exterior chimney. Construction began immediately and was completed on Wednesday, January 1, 1806. About three months later, on Sunday, March 23, the Corps abandoned the fort to begin the return journey to the United States. Today the reconstructed fort is the Fort Clatsop National Memorial and is operated by the National Park Service. There is a fee for entry. The fort burned on Oct. 3, 2005, apparently the result of a stray ember from one of the fire pits at the site. Following the fire, the replica fort was rebuilt at the same site. 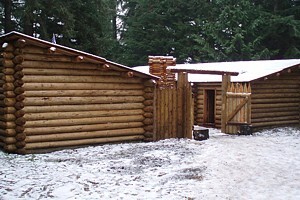 Replica reconstruction of Fort Clatsop. Photo: Wikipedia.